then he set out to destroy a presidency. and who the POTUS called a ‘showboat’ and ‘grandstander’. Who the heck really is James B. Comey? How does the FBI Director become more famous than the President of the United States… … … except by purposeful design. Now, here we are again on Thursday, June 8, as the whole world awaits Comey’s live testimony before Congress. Whenever Comey shows up at a public hearing in the nation’s capital the entire mainstream media (MSM) swarms like bees on honey. Which begs the question: Who stirs the bees up into such a frenzy? James B. Comey is perhaps the most visible face of the dark underbelly of Deep State ever to be trotted out on the world stage during prime time. The CIA agents on contract throughout the MSM just love this guy. Just why is that? Where obvious Deep State pitchmen like Barack Obama and Hillary Clinton, John McCain and Lindsey Graham are supposed to be out there front and center 24/7, FBI Directors were meant to be rarely seen, and never heard. That all changed — MAJORLY — with the inconvenient intersection of Emailgate and Hillary Clinton’s second run for the presidency. Comey’s professional resumé is long and deep as a fixer, just as his political history indicates a strategically placed inside man. Even a cursory look at Comey’s many dubious relationships will reflect “the ultimate inside man” hard at work during most of his career. Such a political fixer and inside man can only be positioned by those who require absolute protection from law enforcement. That would be the countless overt and covert agents of Deep State. Hence, only a prime agent of Deep State could be trusted to provide cover for the multi-decade crime spree that the Clinton crime family is notorious for. The Clinton Foundation alone once employed a veritable “Who’s Who” of Deep State agents many of whom are career criminals in the political realm and financial arena. James Comey has a resumé that is quite interconnected with the Clintons, their foundation and their ongoing crime wave. The following excerpt comes from an exposé which captures only the tip of the Deep State iceberg as it catalogues the incestuous relationship between Comey and the Clintons. Comey is such a blatant criminal that we wouldn’t be surprised to learn that he is on retainer for the Clinton Crime Family through his associations with corporations who are major donors and supporters of the Clintons. Comey has covered up wrongdoing with Hillary’s Email server, the DNC “hacking”, Anthony and Huma Email Scandal, Lockheed Martin, HSBC, Bridgewater, etc., etc., etc. Comey has a long history of involvement in Department of Justice actions that end up favorable to the Clintons. The preceding link well delineates the broad and deep criminal history of James Comey; whereas the piece below describes the recent past. Most of what Comey has done since the election of Donald Trump lies completely below the radar screen. However, with each passing day, the dots have been slowly appearing on the radar. There are those who have been closely watching the screen and connecting those dots into a massive criminal conspiracy. Others have painstakingly investigated the various reactions to the criminal conspiracy which has been apparently commandeered by Comey. The excerpt below, in particular, reveals the response by President Trump and his administration to Comey’s outright interference with the rule of law. 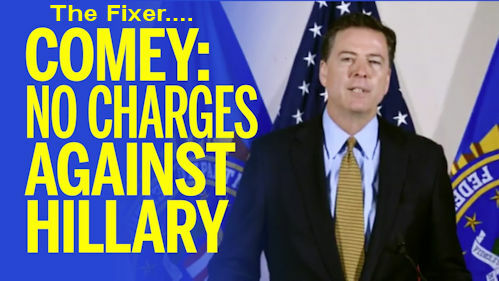 James Comey is a poisonous snake of the highest order… a deep-water Swamp Denizen who has been highly paid to deliberately provide cover for high-level corruption by the Clintons and Obama. He has been central to trying to destroy the Trump campaign and then the Trump administration from the start. He is as dirty as they come in DC. He had highest-level cover (the FBI no less) and was deep into an effort to eliminate Trump. Trump had to move hard, fast, and at exactly the right time to cut the head off the snake without getting bitten by the snake or being finished by the other swamp denizens. This part of the Comey sage continues up to this very morning with the public testimony about to be given by the ex-FBI Director to the Senate Intelligence Committee. The questioning alone is guaranteed to be as explosive as it is radioactive. There is one last perspective on the real James B. Comey. This unique take presents the outside possibility that Comey is a real live double agent. In this highly improbable yet plausible scenario, Comey was set up from the very beginning to infiltrate the Clinton clan. In so doing he did what no one else has done before—he got the goods on all of them. What follows is a snippet from a political commentary which just may have several elements of truth in it. If, on the other hand, Comey was set up by the White Hats all along, he has nothing to worry about … except a Clinton hitman. While this is the most dangerous scenario for him, it also guarantees that Trump has the goods on all of them, for all crimes past and present. This would explain Comey’s picture perfect resumé as an elite fixer. How does a guy construct such an apparently ‘sanitized’ criminal history, at such a high level of operation, except by the deliberate intention to appear as a trustworthy “inside man”? In light of Comey’s startling letter to Congress — only 11 days before the 2016 presidential election — “saying he was reopening the Clinton investigation”, the foregoing possibility must be considered. 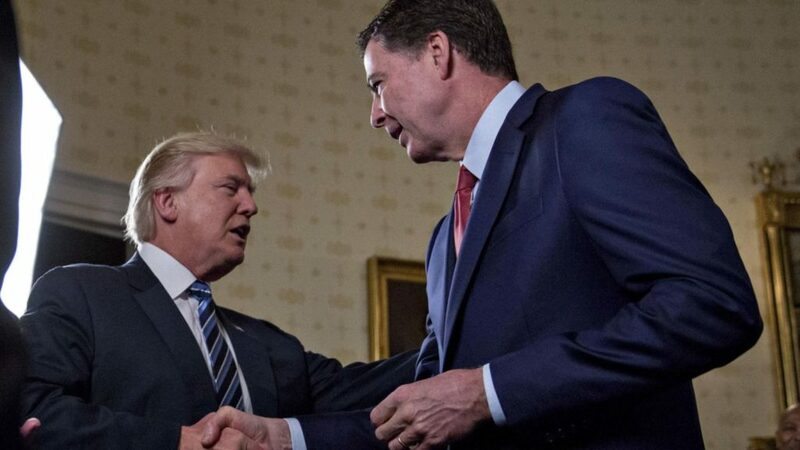 In any case, Comey is going to be on the wrong side of somebody at the end of the day.